Nataliya created this Christmas quilt based on another quilt she made (see here). The original quilt was designed for a low-volume challenge. So, this is a great way to use up your scraps! This quilt is created using 147 flying geese and blocks. These are then put together to create the rows that will make up the quilt. 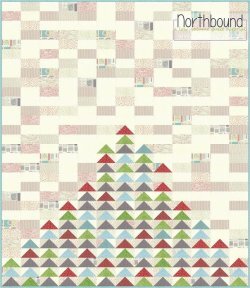 "When I designed this free tutorial it totally reminded me of a Christmas tree and I've been wanting to re-create it in Christmas fabrics ever since."